Tobermorite: Mineral information, data and localities. Named after its discovery locality, Tobermory, Isle of Mull, Scotland. Tobermorite was first described by Heddle (1880) from four Scottish localities, three near Tobermory, Isle of Mull and the fourth being Dunvegan, Isle of Skye. Heddle's material was examinated with XRD by Claringbull & Hey (1952), and found that the powder XRD pattern was characterized by a 11.3 Å basal reflection. After McConnell (1954) the name tobermorite was used for the C-S-H phases having a 11 Å basal spacing. Further studies of crystal structures of "tobermorites" (Merlino et al. 1999, 2000, 2001) showed that tobermorite is actually a series between two endmembers, Ca4Si6O15(OH)2·5H2O and Ca5Si6O17·5H2O. Tobermorite was consequently redefined into two species, tobermorite and clinotobermorite, respectively by IMA in 2014 (Biagioni et al 2015). Tobermorite has been redefined by IMA in 2014 as two minerals: tobermorite and kenotobermorite. Some specimens of Tobermorite-11 Å shrink on dehydration and are called "normal tobermorite", while others do not shrink and are therefore called "anomalous". May appear visually similar to Tacharanite. NOTE: All localities listed here under "tobermorite" should be checked if they are to be assigned to tobermorite or kenotobermorite. Stringhamite 12 photos of Tobermorite associated with Stringhamite on mindat.org. Calcite 10 photos of Tobermorite associated with Calcite on mindat.org. Ellestadite 7 photos of Tobermorite associated with Ellestadite on mindat.org. Pyrite 6 photos of Tobermorite associated with Pyrite on mindat.org. Natrolite 6 photos of Tobermorite associated with Natrolite on mindat.org. Xonotlite 5 photos of Tobermorite associated with Xonotlite on mindat.org. Thaumasite 5 photos of Tobermorite associated with Thaumasite on mindat.org. Phillipsite 4 photos of Tobermorite associated with Phillipsite on mindat.org. Whelanite 4 photos of Tobermorite associated with Whelanite on mindat.org. Thomsonite 4 photos of Tobermorite associated with Thomsonite on mindat.org. 72.3.2.4 Riversideite Ca5(HSi3O9)2 · 2H2O Orth. Heddle, M.F. (1880) Preliminary notice of substances which may prove to be new minerals. Mineralogical Magazine: 4: 117-123. Currie, J. (1905) Note on some new localities for Gyrolite and Tobermorite. Mineralogical Magazine: 14: 93-95. Claringbull, G.F. and Hey, M.H. (1952) A reexamination of tobermorite. Mineralogical Magazine: 29: 960-962. McConnell, J.D.C. (1954) The hydrated calcium silicates riversideite, tobermorite and plombierite. Mineralogical Magazine: 30: 293-305. Megaw, H.D., and Kelsey, C.H. (1956) Crystal Structure of Tobermorite. Nature: 177: 390-391. Mitsuda, T., and Taylor, H.F.W. (1978) Normal and anomalous tobermorites. Mineralogical Magazine: 42(322): 229-35. Hamid, S.A. (1981) The crystal structure of the 11Å natural tobermorite Ca2.25[Si307.5(OH)1.5].1 H20. Zeitschrift für Kristallographie: 154: 189-198. Merlino, S., Bonaccorsi, E. and Armbruster, T. (1999) Tobermorites: their real structure and order-disorder (OD) character. American Mineralogist: 84: 1613-1621. Merlino, S., Bonaccorsi, E. and Armbruster, T. (2000) The real structures of clinotobermorite and tobermorite 9 Å: OD character, polytypes, and structural relationships. European Journal of Mineralogy: 12: 411-429. Merlino, S., Bonaccorsi, E., and Armbruster, T. (2001) The real structure of tobermorite-11Å: normal and anomalous forms, OD character and polytypic modifications. European Journal of Mineralogy: 13(3): 577-590. J. Kikuma, M. Tsunashima, T. Ishikawa, S. Matsuno, A. Ogawa, K. Matsui and M. Sato (2009) Hydrothermal formation of tobermorite studied by in situ X-ray diffraction under autoclave condition. J. Synchrotron Rad. : 16: 683-686. Biagioni, C., Bonaccorsi, E., Lezzerini, M., Merlino, S. (2016) Thermal behaviour of Al-rich tobermorite. European Journal of Mineralogy: 28(1): 23-32. The following Tobermorite specimens are currently listed for sale on minfind.com. Stojanovic, D., Dordevic, D., & Derkovic, B. (1974). Suolunite and tobermorite in the diabase rocks of Kulaski, near Doboj, Bosnia, Yugoslavia. Bull. Mus. DΓHist. Nat. Belgrade, ser. A, 29, 5-15. А.Е.Задов и др. Новые находки и исследования минералов группы тоберморита, //Записки ВМО, 1995, т.124, N2, с.36-54. ; Chukanov, N. V. (2013). Infrared spectra of mineral species: extended library. Springer Science & Business Media. Boisson, J.-M. & Leconte, J. (2014): Analyses 2012-2013 MNHN-MICROMONTEURS. La revue de Micromonteurs, 21. Hentschel, G., Dent Glasser, L.S., Lee, C.K. (1983): Jasmundite. Ca22(Si04)8O4S2. a new mineral, N. Jb. Mineral., Mh., 337-342. Kovács-Pálffy, P. et al. (2005): A Magyar Állami Földtani Intézet Évi Jelentése, 95-118. Szakáll & Gatter: Hun. Min. Spec., 1993; Kovács, I. et al. (2009): Guide to the Bakony-Balaton Volcanic Highland, Field Trip 1, 7th September 2009. MinPet2009 field trip booklet, 23 pp. • Stoppani, F.S. & Curti, E. (1982): I minerali del Lazio. Editoriale Olimpia, Firenze, 291 pp. 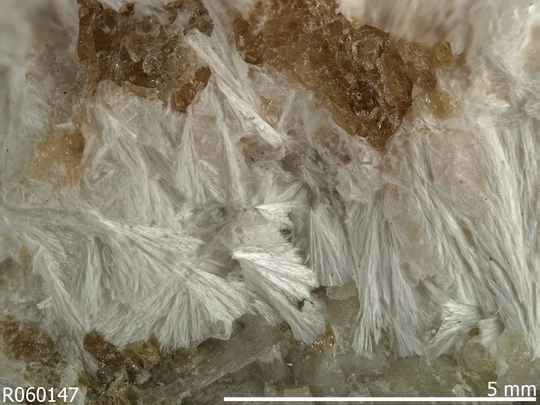 Sicurella, G., Russo, S., Ciriotti, M.E., Blass, G. (2010): Mineralogia della formazione di Monte Caliella, Palagonia (Catania, Sicilia). Micro (località), 2/2010, 371-408. G. Gottardi, E. Passaglia (1967): Tobermorite "non espandibile" e Gyrolite del Monte Biaena (Trento). Periodico di Mineralogia, XXXVI, pagg. 1079-1083. - Exel R. (1980): Die Mineralien Tirols. Band 1. Südtirol und Trentino. Athesia Druck, Bolzano-Bozen, 213 pp. - Exel R. (1987): Guida mineralogica del Trentino e del Sudtirolo. Casa Editrice Athesia, Bolzano-Bozen, 205 pp. Gottardi G., Passaglia E. (1965): Tobermorite “non espandibile” di Prà de la Stua (Trento). Period. Mineral. 35 197-204.; Mitsuda, T., & Taylor, H. F. W. (1978). Normal and anomalous tobermorites. Mineral. Mag, 42(322), 229-35. Henmi, C., & Kusachi, I. (1992). Clinotobermorite, Ca5Si6 (O, OH) 18· 5H2O, a new mineral from Fuka, Okayama Prefecture, Japan. Mineralogical Magazine, 56(3), 353-358.; KUSACHI, I., & HENMI, C. (1991). Sillenite from Fuka, Okayama prefecture, Japan. Mineralogical Journal, 15(8), 343-348. Khoury, H. N., Salameh, E., & Abdul-Jaber, Q. (1985). Characteristics of an unusual highly alkaline water from the Maqarin area, northern Jordan. Journal of Hydrology, 81(1), 79-91.; Pitty, A. F., & Alexander, W. R. (2010). A natural analogue study of cement buffered, hyperalkaline groundwaters and their interaction with a repository host rock IV: an examination of the Khushaym Matruk (central Jordan) and Maqarin (northern Jordan) sites. NDA-RWMD Technical Report, NDA, Moors Row, UK. ; Khoury, H. and Nassir, S. (1982): High temperature mineralization in the bituminous limestone in Maqarin area - North Jordan. Neues Jahrbuch für Mineralogie, Abhandlungen, 144, 197-213. Panczner (1987): 100-378.; Mitsuda, T., & Taylor, H. F. W. (1978). Normal and anomalous tobermorites. Mineral. Mag, 42(322), 229-35. Yakovenchuk, V.N., Ivanyuk, G.Yu., Pakhomovsky, Y.A., Selivanova, E.A., Mikhailova, J.A., Krivovichev, S.V., Zolotarev, A.A. and Zalkind, O.A. (2011): Ellingsenite, Na5Ca6Si18O38(OH)13·6H2O, a new martinite-related mineral from phonolite of the Aris alkaline complex (Namibia). Canadian Mineralogist, 49, 1165-1173. Sokol, E.V., Gaskova, O.L., Kokh, S.N., Kozmenko, O.A., Seryotkin, Y.V., Vapnik, Y., Murashko, M.N. (2011): Chromatite and its Cr3+- and Cr6+-bearing precursor minerals from the Nabi Musa Mottled Zone complex, Judean Desert. American Mineralogist 96, 659-674. Zadov, A. E.; Grabezhev, A. I.; Pertsev, N. N.; Chukanov, N. V.; Pribavkin, S. V. (2006): Tobermorite-plombierite metasomatites of the Gumeshevsk skarn-porphyry copper deposit, Middle Urals. Doklady Earth Sciences 407A, 495-497. ; American Mineralogist, Volume 94, pages 323–333, 2009; Grabezhev, A. I., Pertsev, N. N., Zadov, A. E., Pribavkin, S. V., & Murzin, V. V. (2007). Calcic hydrosilicate metasomatic rocks at the Gumeshevsk skarn-porphyry copper deposit in the central Urals, Russia. Petrology, 15(5), 514-522. Ďuďa, R., Scharmová M., Černý, P. (1993): Minerály xenolitov z Vechca (Slanské vrchy). Zborník Východoslov. múzea v Košiciach, Prírodné vedy 34, 17-29 (in Slovak). Gutzmer, J. & Cairncross, B. (1993): Recent discoveries from the Wessels mine South Africa. Mineralogocal Record 24 (5): 365-368; Merlino, S., Bonaccorsi, E., & Armbruster, T. (2001). The real structure of tobermorite 11Å normal and anomalous forms, OD character and polytypic modifications. European Journal of Mineralogy, 13(3), 577-590.; Biagioni, C., Bonaccorsi, E., Lezzerini, M., Merlini, M., & Merlino, S. (2012). Thermal behaviour of tobermorite from N’Chwaning II mine (Kalahari Manganese Field, Republic of South Africa). I. Thermo-gravimetric and X-ray diffraction studies. European Journal of Mineralogy, 24(6), 981-989.; Gutzmer, J. (1996). Genesis and alteration of the Kalahari and Postmasburg manganese deposits, Griqualand West, South Africa (Doctoral dissertation, Rand Afrikaans University). McConnell, J.D.C. 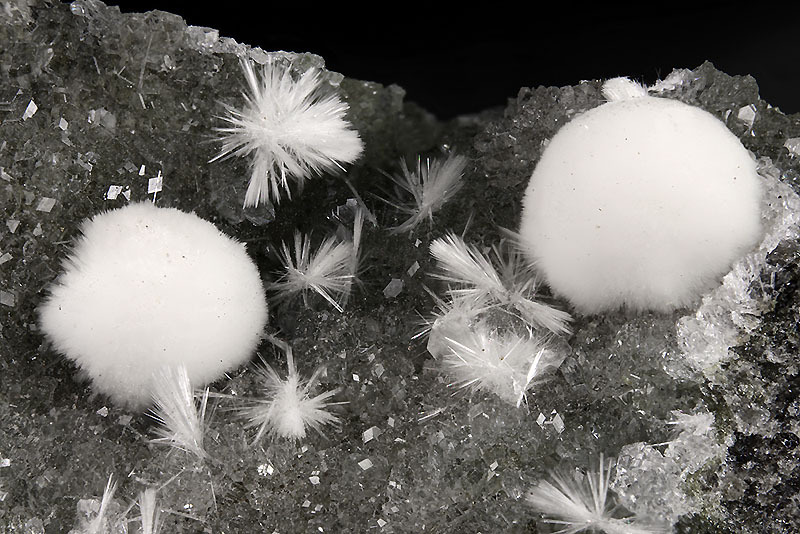 (1954) The hydrated calcium silicates riversideite, tobermorite, and plombierite. Mineralogical Magazine, 30(224), 293-304.; McConnell, J.D.C. (1955) A Chemical, Optical and X-ray Study of Scawtite from Ballycraigy, Larne, N Ireland. American Mineralogist, 40(5-6), 510-514.; Harker, R.I. (1965) Scawtite and its synthesis. Mineralogical Magazine, vol. 34, n° 268, 232-236 (referring to McConnell, 1954). Livingstone, A. (1988): Reyerite, tobermorite, calcian analcime, and bytownite from amygdales in a Skye basalt. Mineralogical Magazine 52, 711-713. McConnell, J. D. C. (1954). 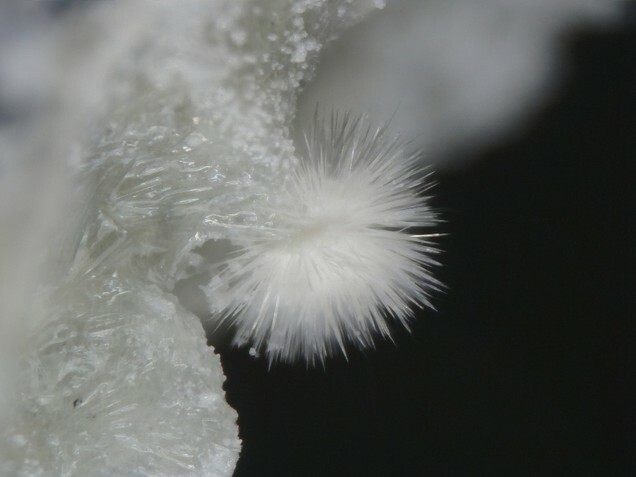 The hydrated calcium silicates riversideite, tobermorite, and plombierite. Mineral. Mag, 30(224), 293-304. Webb, A. B. S. T. (1971). Tobermorite from Castle Hill near Kilbirnie, Ayrshire. Mineralogical Magazine, 38, 253. Anthony, J.W., et al (1995), Mineralogy of Arizona, 3rd.ed. : 397, 428; Cesbron, F.P. & S.A. Williams (1980), Apachite and gilalite, two new copper silicates from Christmas, AZ, Mineralogical Magazine: 43: 639-641. American Mineralogist: 51: 56-74; Pemberton, H. Earl (1983), Minerals of California; Van Nostrand Reinholt Press: 477, 478. UGMS Bull 117 Minerals and Mineral Localities of Utah; North, Jerry (2010) Displays of Nature : History, Minerals & Crystals of Utah's Bingham Canyon Copper Mine. ; Mitsuda, T., & Taylor, H. F. W. (1978). Normal and anomalous tobermorites. Mineral. Mag, 42(322), 229-35.